Gov. Palin: Live in NJ? Remember to vote for Lonegan tomorrow! New Jersey, the eyes of America are on you tomorrow! Know anyone in NJ? Call them tonight and remind them to vote for conservative Steve Lonegan tomorrow. Let’s make history. Let’s elect Steve Lonegan to the U.S. Senate tomorrow! Here’s something you can do to help elect Steve Lonegan to the U.S. Senate this Wednesday. Make five phone calls to any New Jersey voters you know. It doesn’t matter if they’re Democrats or Republicans or no party at all. Call them and tell them to vote for Steve Lonegan this Wednesday. Then ask them to call five people THEY know. Spread the word! Don’t just stop at five people. Call even more if you can. Please be sure to get to the polls this Wednesday, October 16, and vote for Steve Lonegan. If someone you know can’t get to the polls, give them a ride. Let’s do all we can to secure a win for New Jersey on Wednesday! Thank you to all the Wausau, Wisconsin, residents who showed up to protest a wrongheaded school directive against Christmas carols. Wausau showed that there is power in unity as we battle against Scrooges who want Christ out of Christmas. My new book tackles issues like this one. It explains the steps we can take to combat the Scrooges so that we may forever protect the heart of Christmas from those who seek to diminish its true meaning. Governor Palin posted the following on her Facebook page and as an op-ed at Breitbart.com yesterday. Governor Palin and Senators Cruz and Lee spoke with Greta van Susteren at the Million Veterans March in Washington, D. C. on Sunday. Greta later showed this segment On the Record last night. Iowa Faith & Freedom Coalition is pleased to announce that Gov. Sarah Palin has been added as a featured speaker at the 13th Annual Friends of the Family Banquet on November 9, 2013 in Des Moines, IA. 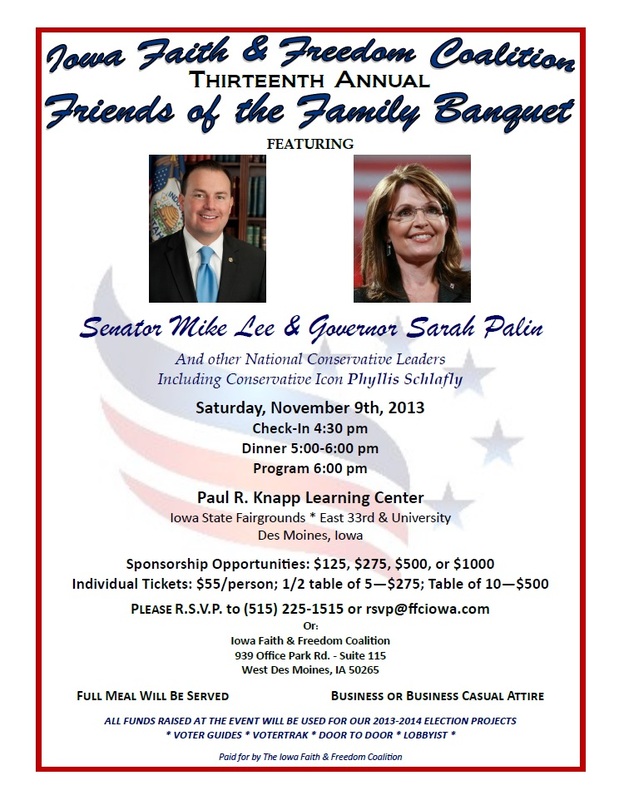 Palin will be joining Sen. Mike Lee (R-Utah) and Phyllis Schlafly, President of Eagle Forum, at the event. See the flyer below for further details or at our website at www.ffciowa.com. You will not want to miss out!